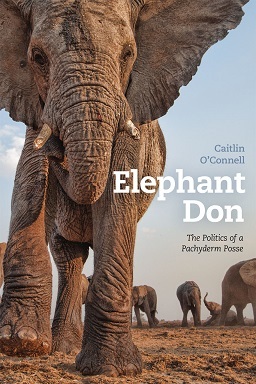 An excerpt from Elephant Don: The Politics of a Pachyderm Posse by Caitlin O’Connell “Kissing the Ring” Sitting in our research tower at the water hole, I sipped my tea and enjoyed the late morning view. A couple of lappet-faced vultures climbed a nearby thermal in the white sky. A small dust devil of sand, dry brush, and elephant dung whirled around the pan, scattering a flock of guinea fowl in its path. It appeared to be just another day for all the denizens of Mushara water hole—except the elephants. For them, a storm of epic proportions was brewing. It was the beginning of the 2005 season at my field site in Etosha National Park, Namibia—just after the rainy period, when more elephants would be coming to Mushara in search of water—and I was focused on sorting out the dynamics of the resident male elephant society. I was determined to see if male elephants operated under different rules here than in other environments and how this male society compared to other male societies in general. Among the many questions I wanted to answer was how ranking was determined and maintained and for how long the dominant bull could hold his position . . .
Donald L. Levine (1931–2013), the Peter B. Ritzma Professor Emeritus of Sociology at the University of Chicago (where he served as dean of the College from 1982 to 1987), passed away earlier this month at the age of 83, following a long illness. Among his significant contributions to the field of sociology were five volumes (The Flight from Ambiguity, Greater Ethiopia, Powers of the Mind, Wax and Gold, and Visions of the Sociological Tradition), an edited collection (Georg Simmel on Individuality and Social Forms), and a translation (Simmel’s The View of Life), all published by the University of Chicago Press. 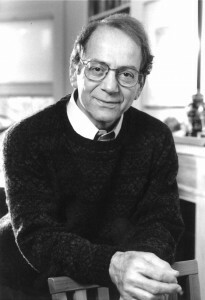 As chronicled in memoriam by Susie Allen for UChicagoNews: Over his long career, Levine published several works that are now considered landmarks of sociology. 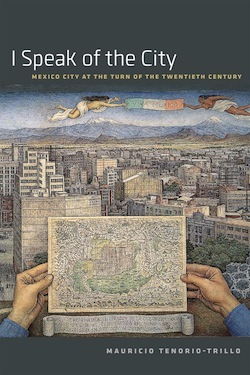 His “masterpiece,” according to former student Charles Camic, was Visions of the Sociological Tradition, published by the University of Chicago Press in 1995. 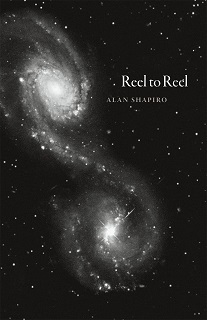 In that book, Levine traced the intellectual genealogy of the social sciences and argued that different traditions of social thought could productively inform one another. “It’s a brilliant analysis of theories and intellectual traditions, but also a very thoughtful effort to bring them into intellectual dialogue with one another,” said Camic, PhD’79, now a professor of sociology at . 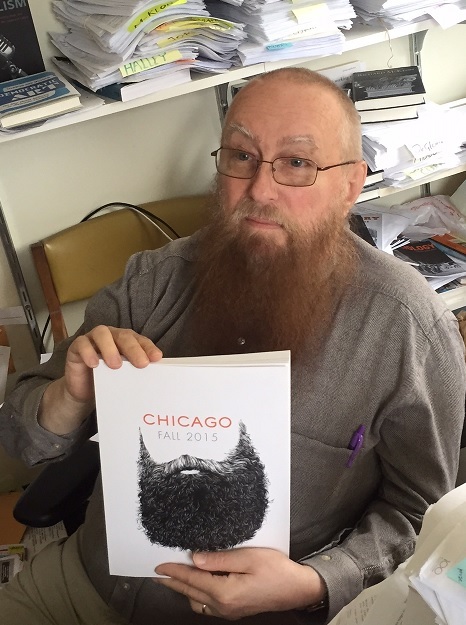 . .
We’ve gone mimetic and we’re not coming back; executive editor Doug Mitchell models our new on-brand lookbook. We call it Informcore. 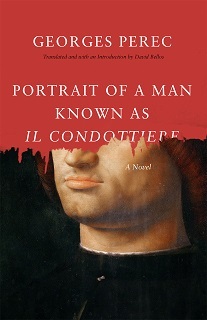 In the meantime, here’s a link to what’s on offer for Fall 2015. . . .
An excerpt from Portrait of a Man Known as Il Condottiere by Georges Perec *** Madera was heavy. I grabbed him by the armpits and went backwards down the stairs to the laboratory. His feet bounced from tread to tread in a staccato rhythm that matched my own unsteady descent, thumping and banging around the narrow stairwell. Our shadows danced on the walls. Blood was still flowing, all sticky, seeping from the soaking wet towel, rapidly forming drips on the silk lapels, then disappearing into the folds of the jacket, like trails of slightly glinting snot side-tracked by the slightest roughness in the fabric, sometimes accumulating into drops that fell to the floor and exploded into star-shaped stains. I let him slump at the bottom of the stairs, right next to the laboratory door, and then went back up to fetch the razor and to mop up the bloodstains before Otto returned. But Otto came in by the other door at almost the same time as I did. He looked at me uncomprehendingly. I beat a retreat, ran down the stairs, and shut myself in the laboratory. I padlocked the door and jammed the wardrobe up against it. 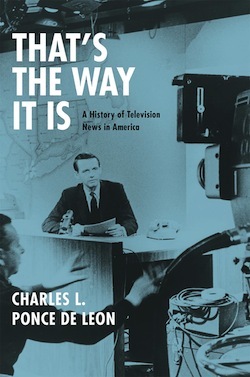 He came down a . . .
An excerpt from That’s the Way It Is: A History of Television News in America by Charles L. Ponce de Leon *** “Beginnings” Few technologies have stirred the utopian imagination like television. Virtually from the moment that research produced the first breakthroughs that made it more than a science fiction fantasy, its promoters began gushing about how it would change the world. Perhaps the most effusive was David Sarnoff. Like the hero of a dime novel, Sarnoff had come to America as a nearly penniless immigrant child, and had risen from lowly office boy to the presidency of RCA, a leading manufacturer of radio receivers and the parent company of the nation’s biggest radio network, NBC. More than anyone else, it was Sarnoff who had recognized the potential of “wireless” as a form of broadcasting—a way of transmitting from a single source to a geographically dispersed audience. Sarnoff had built NBC into a juggernaut, the network with the largest number of affiliates and the most popular programs. He had also become the industry’s loudest cheerleader, touting its contributions to “progress” and the “American Way of Life.” Having blessed the world with the miracle of radio, he promised Americans an even more . . .
“Can We Race Together? 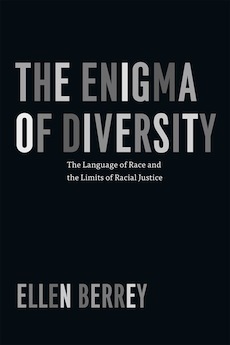 An Autopsy”* by Ellen Berrey *** Corporate diversity dialogues are ripe for backlash, the research shows, even without coffee counter gimmicks. Corporate executives and university presidents are, yet again, calling for public discussion on race and racial inequality. Revelations about the tech industry’s diversity problem have company officials convening panels on workplace barriers, and, at the University of Oklahoma spokespeople and students are organizing town-hall sessions in response to a fraternity’s racist chant. The most provocative of the efforts was Starbucks’ failed Race Together program. In March, the company announced that it would ask baristas to initiate dialogues with customers about America’s most vexing dilemma. Although public outcry shut down those conversations before they even got to “Hello,” Starbucks said it would nonetheless carry on Race Together with forums and special USA Today discussion guides. As someone who has done sociological research on diversity initiatives for the past 15 years, I was intrigued. For a moment, let’s take this seriously What would conversations about race have looked like if they played out as Starbucks imagined, given the social science of race? Can companies, in Starbucks’ CEO Howard Schultz’s words, “create a more empathetic and inclusive society—one conversation . 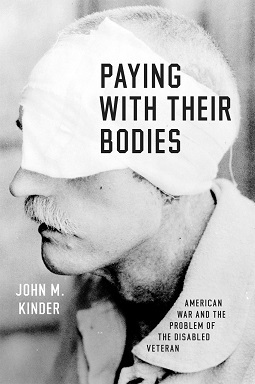 . .
An excerpt from Paying with Their Bodies: American War and the Problem of the Disabled Veteran by John M. Kinder *** Thomas H. Graham On August 30, 1862, Thomas H. Graham, an eighteen-year-old Union private from rural Michigan, was gut-shot at the Second Battle of Bull Run near Manassas Junction, Virginia. One of 10,000 Union casualties in the three-day battle, Graham had little chance of survival. Penetrating gunshot wounds to the abdomen were among the deadliest injuries of the Civil War, killing 87 percent of patients—either from the initial trauma or the inevitable infection. Quickly evacuated, he was sent by ambulance to Washington, DC, where he was admitted to Judiciary Square Hospital the next day. Physicians took great interest in Graham’s case, and over the following nine months, the young man endured numerous operations to suture his wounds. Deemed fully disabled, he was eventually discharged from service on June 6, 1863. But Graham’s injuries never healed completely. His colon remained perforated, and he had open sinuses just above his left leg where a conoidal musket ball had entered and exited his body. As Dr. R. C. Hutton, Graham’s pension examiner, reported shortly after the Civil War’s end, “From each of these sinuses . 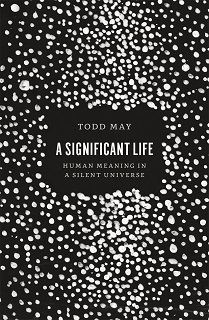 . .
“A Meaningful Life” An excerpt from A Significant Life: Human Meaning in a Silent Universe by Todd May *** Let us start with a question. What does it mean to ask about the meaningfulness of life? It seems a simple question, but there are many ways to inflect it. We might ask,“What is the meaning of life?” Or we could ask it in the plural: “What are the meanings of life?” If we put the question either of these ways, we seem to be asking for a something orsomethings, a what that gives a human life its meaningfulness. The universe is thought or hoped to contain something—a meaning—that is the point of our being alive. If the universe contains a meaning, then the task for us becomes one of discovery. It is built into the universe, part of its structure. In the image that some philosophers like to use, it is part of the “furniture” of the universe. When we say that the meaning of life is independent of us—that is, independent of what any of us happens to believe about it—we do not need to believe that there would be a meaning to our lives even if none . . .